Have you ever imagined a time when you'll be unable to make decisions for yourself? Who knows how you would make decisions? What information would you want? What do you think about life-prolonging treatments? Who knows how you feel about dying? Who knows you? We don't like to think about those types of things—at least my family doesn't, and I'd be surprised if we were the only ones. You might, like me, have an advance directive gathering dust in some corner of your home, with another copy in the hands of your health care proxy and yet another stapled to a patient chart you haven't seen in years. And while having an advance directive is an important first step, starting an ongoing conversation about what it means and why it says what it says is really at the heart of making it something helpful to you and your caregivers. Thanks to a recent decision by the Centers for Medicare and Medicaid Services (CMS), providers covered by the Medicare Physician Fee Schedule will be reimbursed for conversations with older adults about their goals and preferences for care. 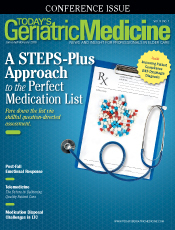 In full disclosure, the American Geriatrics Society (AGS, where the author is CEO), has commented extensively in support of this new service, and we could not be more delighted with the CMS decision. The service, advance care planning, is a comprehensive ongoing person-centered approach to communication about future health care choices. In plain English, that means it involves brief periodic discussions with patients about health and care to help with developing an advance directive and with shaping a plan for future care should a patient be unable to speak for him or herself. Many stakeholders joined the AGS in supporting advance care planning. Research has shown that it leads to better care, higher patient and family satisfaction with the health care system, and lower rates of caregiver distress, depression, and lost productivity because people know more about what to expect from long-term and end-of-life care.1 A recent news story described CMS' recognition of advance care planning as a "precedent-setting" change. But really, it's something geriatrics experts have known (and practiced) all along: Quality of care can be improved dramatically when older adults and their health care teams work together through complex issues to ensure that care is personalized to that older adult. That doesn't mean advance care planning is easy. We know it will involve thinking about and discussing questions that are uncomfortable for many people—health professionals included. But starting the conversation in an open, honest, and respectful way is an important first step—and it's where geriatrics professionals have an opportunity to lead. • PrepareForYourCare.org, a project driven by Rebecca Sudore, MD, an AGS member and an associate professor of medicine at the University of California, San Francisco, is an entire website dedicated to walking people through medical decisions, talks with care providers, and ways to pursue care that's person-centered. • CaringInfo.org has downloadable copies of advance directives for all 50 states, Puerto Rico, and the District of Columbia. A quick search for Physician Orders for Life-Sustaining Treatment and Medical Orders for Life-Sustaining Treatment can also help point you in the right direction for formalizing care preferences. • And for explaining specific health conditions and concerns, HealthinAging.org has a wealth of resources reviewed by AGS experts and written in language that's more accessible to the average older adult. While we can't promise that change will make the questions behind advance care planning any easier to discuss, we're confident that recognition from organizations like the CMS is a big step forward for making person-centered conversations a routine part of our health care. — Nancy Lundebjerg, MPA, is CEO of the American Geriatrics Society, a nationwide not-for-profit society of geriatrics health care professionals dedicated to improving the health, independence, and quality of life of older people. 1. Detering KM, Hancock AD, Reade MC, Silvester W. The impact of advance care planning on end of life care in elderly patients: randomised controlled trial. BMJ. 2010;340:1345. Teno JM, Gruneir A, Schwartz Z, Nanda A, Wetle T. Association between advance directives and quality of end-of-life care: a national study. J Am Geriatr Soc. 2007;55(2):189-194. Molloy DW, Guyatt GH, Russo R, et al. Systematic implementation of an advance directive program in nursing homes: a randomized controlled trial. JAMA. 2000;283(11):1437-1444.